An improvised explosive device blew up near a tour bus in the Haram area in Egypt on the road from Cairo to the Great Pyramids. Four people (or two, according to some reports) were killed and a dozen or more others wounded. Three of the dead were Vietnamese tourists, and the other was a local tour guide. Egypt’s interior ministry says police have killed 40 suspected fighters after roadside bomb attack killed four people. 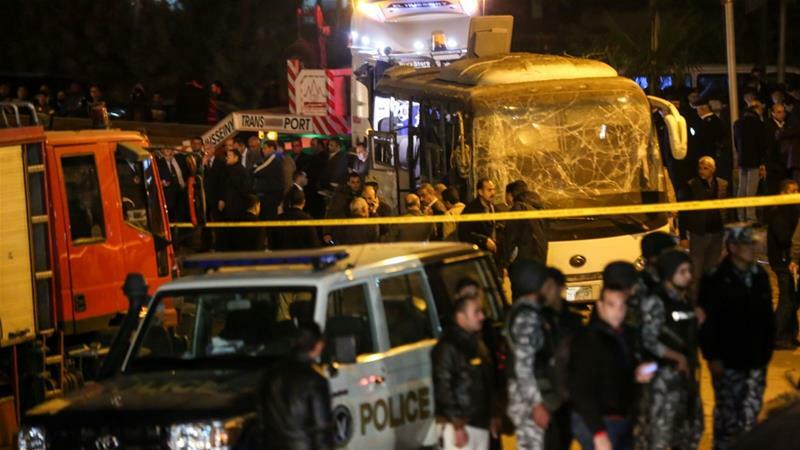 Egypt’s interior ministry has said at least 40 fighters have been killed on Saturday in response to an attack on a tourist bus in which four people were killed the night before. According to the official state news agency MENA, security forces killed the suspected fighters in raids in Giza and northern Sinai – a volatile desert region that has been a hotbed for various armed groups. Three Vietnamese tourists and an Egyptian guide were killed and 11 others injured when a bomb blast hit their bus on Friday less than 2.5 miles from Egypt’s world famous Giza pyramids, authorities said. A roadside bomb hit a tourist bus near the Pyramids of Giza, south of the capital Cairo, on Friday, killing three Vietnamese tourists and their Egyptian guide. The blast wounded 11 others, including Vietnamese tourists as well as the Egyptian driver. The bombing is the first deadly attack against foreign tourists in Egypt in more than a year and comes as the tourism sector, a vital source of foreign currency revenue, recovers from a sharp drop in visitor numbers since a 2011 uprising that toppled former leader Hosni Mubarak. Egypt has for years been battling an armed movement in the thinly populated Sinai, which has gained pace since the military overthrew democratically elected President Mohamed Morsi of the Muslim Brotherhood in mid-2013. Other armed groups are active in Cairo, as well as other cities, where they have targeted security forces, judges and pro-government figures in the past few years. The government says the battle against such groups is a priority as it works to restore stability after the years that followed the 2011 protests.